Yesterday I posted about my creative process and how inspired I've been by spring this year. Here is one of the results of my inspiration: a new collection of five Gracious Pansy thank you cards. Pansies are associated with many great qualities including humility, cheerfulness and remembrance, which makes them perfect for showing your gratitude with this thank you card. 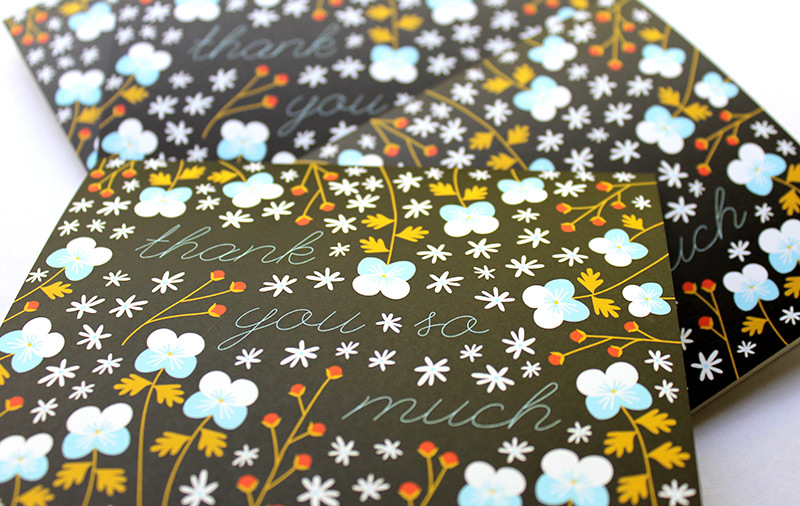 The card reads “thank you so much” surrounded by a field of illustrated flowers. These cards are printed in the USA on 110# recycled card stock and designed in California. It's the time of year to be thankful, so what better way to be ready than to stock up on thank you cards? I have two new designs plus a shop full of cards. Welcome our new editions! Two food-inspired cards "you're rad" and "you're egg-cellent" featuring food illustrations printed on super thick recycled card stock and printed in USA. They are available in singles and sets, so get yours today! And treat yourself to 15% off your order with the code "THANKS17". Expires Dec 1, so shop now! I am thankful to all my customers and clients who keep my business afloat and allow me to have my dream job. THANK YOU SO MUCH! I re-stocked some thank you cards & blank greetings. Available in singles & sets in the shop. Here is something a little bright for these short winter days. I've been working on a new organic inspired card collection. First up are these brand new floral thank you cards featuring tulips and roses and even a little bee! Everyone loves receiving thank you cards. These are available in singles and soon in packs and include bright red envelopes. These will really stand out in the mail! I have a limited supply available on Etsy. Part of the collection includes this abstract tulip pattern in peach and rusty red. Interior is blank for your own custom message. These cards are great for a variety of occasions including thank yous, or just to say "hello". I'll be revealing more cards soon. I'm so happy to share another new greeting card with you. This card features a fall inspired pattern of colorful leaves and flower buds. It says "you're the best" in a playful script typeface. I really loved creating this design. The most challenging part was figuring out the color palette which went through many iterations. The fall look really came together and even though we are just days away from Summer, the fall palette is timeless. You can buy it on Etsy.